How many varieties of idli have you tasted or heard of? Five, ten, fifteen or twenty! Chennai, a haven of idli and dosa for foodies, boasts as many as 2000 varieties of idli. All thanks to M Eniyavan, a Class 8 dropout and former auto-rickshaw driver who created and recreated these many idli varieties for the city folks and tourists. Popularly known as ‘Idli Eniyavan,’ the Chennaite not only switched from driving an auto-rickshaw to running a restaurant but went on to invent more than 2000 varieties of idli. Inspired by a daily female passenger who used to carry idli in his auto, Eniyavan’s journey is an inspiring story of his zeal for innovation much like the story of Pune’s Navnath Yewle Chaiwala who earns Rs 12 lakh a month. Chennai-based Eniyavan sells and serves over 30 idli varieties at his restaurant, Mallipoo Idli which he set up in 1997. 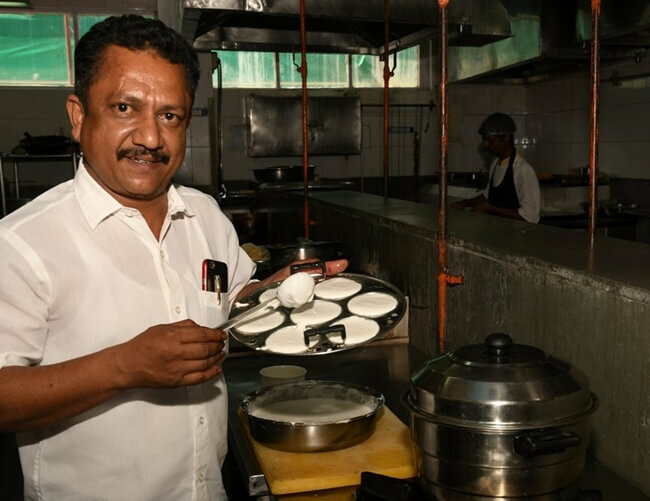 The 48-year-old immersed himself so deep in the art of creating idli varieties that the savory steamed Indian rice cake has become an elixir of his life. He says that he can do anything to make idli more appealing and delicious for gastronomes as it unlocked the door to a world of joy and happiness for him. The fame, success and prosperity that he enjoys today were not handed to him on a silver plate. The Mallipoo Idli restaurant owner, Eniyavan worked his way up. Owing to his economically disadvantaged background, he dropped out of school after Class 8 in Coimbatore. Initially, he took up many odd jobs like waiting tables and washing tea glasses to earn his living. Then he switched to driving an auto-rickshaw in Coimbatore. It is said that there is a woman behind every successful man. The woman behind Eniyavan’s success was his daily female passenger named Chandra, when he used to drive auto-rickshaw. Chandra was an idli seller. She would travel to sell her homemade idli in the nearby neighborhoods. One day she, carrying a huge trough of idli batter boarded Eniyavan’s auto-rickshaw. She became a daily passenger and started delivery of her culinary merchandise in his auto. It piqued Eniyavan’s interest in making and selling idli. He learned basics of the business during his regular conversation with her. With two idli steamers, Eniyavan left Coimbatore for a new beginning in Chennai. He took shelter under the thatched roof of a dilapidated house in north Chennai and set out to work. His initial efforts were greeted with hard luck in the form of heavy rains. His first attempt at idli making turned out to be a failure, and he lost everything including the batter to the torrential rains. Though it disappointed him, he did neither break down nor lose hope. He remained stick to what he started believing in. He developed the business working tirelessly. To make the business sustain in the long run, he realized that he needed to be creative. He started experimenting with the recipe of idli using various ingredients including chocolate, corn, orange pulp and almond. Tender coconut idli was one of his first innovations. He has successfully managed to create over 2000 varieties of idli so far. He also tried his luck in the Guinness Book of World Records by preparing a gigantic 125-kg idli. Eniyavan admits that the recipe of coconut idli was not something unheard of. He borrowed the idea from his grandmother who used to add coconut water to make appam. With the passing of time, he came up with Mickey Mouse idli and Kung Fu Panda idli. Once his children asked him for pizza, he made pizza idli. Thus his business, Mallipoo Idli restaurant, kept on rolling through a series of innovations. Today, the restaurant is not just a reputed food outlet but a landmark in Chennai. Diligence, innovation and creativity always pay off rich dividends.